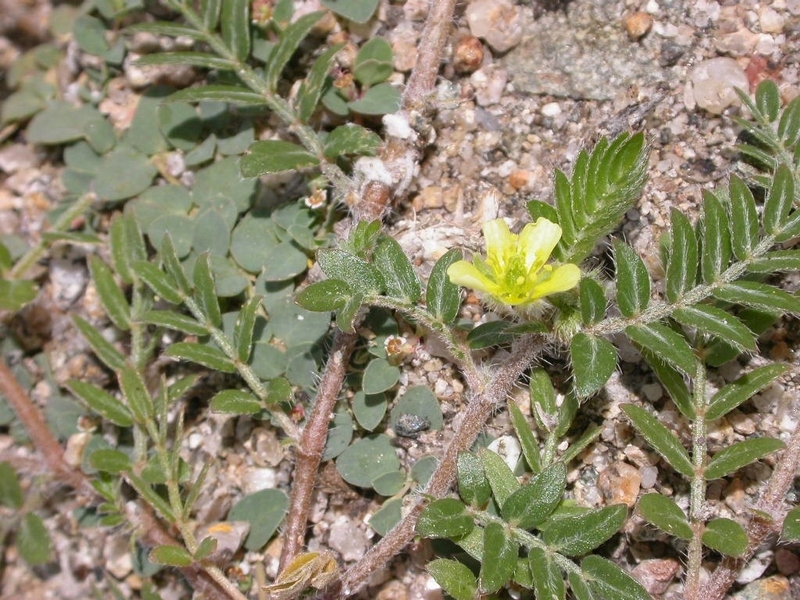 Puncturevine (Tribulus terrestris) is an aptly named summer annual found widely in California. Native to southern Europe, it can grow under a wide range of conditions, but its success is likely due to its ability to thrive in hot and dry conditions where other plants cannot. It can be a major problem in orchards, pastures, turf, and along roadsides and ditch banks. 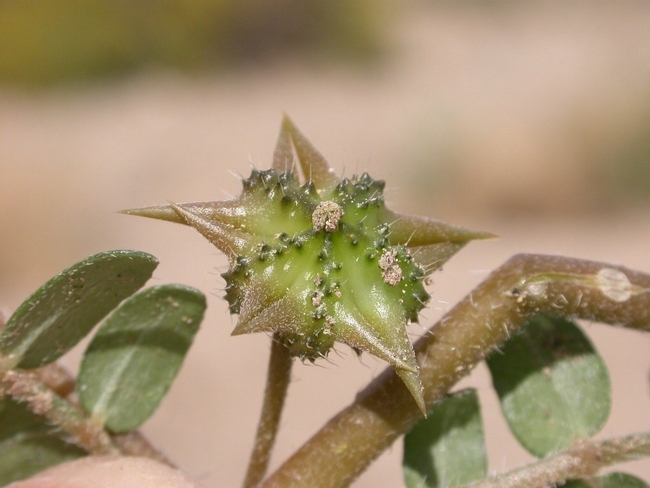 Although it is known to be toxic to sheep, its main weedy characteristic, as indicated by its common names of puncturevine or caltrop, is its spiky seedpods. (A caltrop is a metal device, used to deter passage by vehicles with pneumatic tires or the hooves of horses; it has four projecting spikes so arranged that when three of the spikes are on the ground, the fourth points upward to poke a tire or hoof.) The seeds of puncturevine are enclosed in a hard caltrop-like case that can injure livestock, people, and pets when stepped on and can even puncture bicycle tires. Another common name is "goathead." Growing up in Fresno it was always a problem with bike tires. It seemed that more time was spent tire repairing than riding the bike. 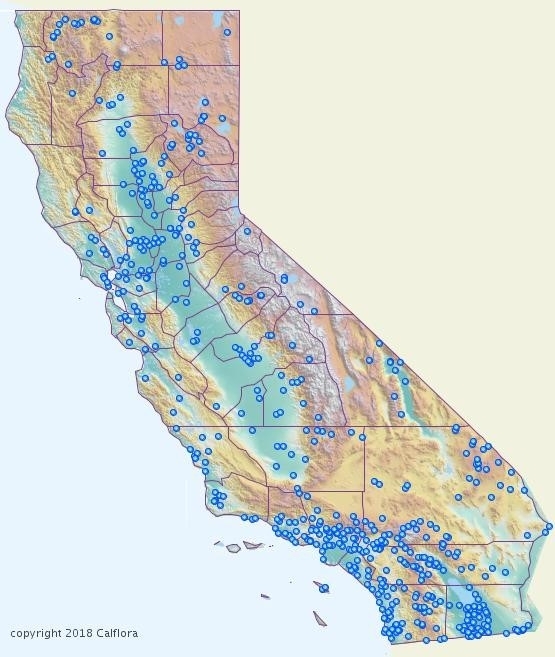 It's distribution is pretty much throughout California and seems more concentrated in Southern California. There have been more calls recently about the plant, but it has been a common complaint for many years. Puncturevine is a summer annual broadleaf weed that generally grows low to the ground forming dense mats 2 to 5 feet in diameter. The stems radiate out from a central point at the taproot. The plant does not root from the stems. The hairy leaves are opposite each other and divided into four to eight pairs of leaflets that are also opposite each other. Yellow flowers up to 1/2 inch wide with five petals are found in the leaf axils. After the flower is pollinated, a seedpod forms that is a cluster of five flat spiny burrs containing up to five seeds. As the seedpod matures, it turns gray or tan, gets very hard and breaks apart so that the individual spikes, or burrs, can stick into passing animals and tires. These burrs disperse by adhering to tires, shoes and clothing of people, and the fur, feathers, or feet of animals. Puncturevine germinates in the spring and summer from seeds produced the previous year. Good soil moisture and warm temperatures are needed for germination, but after the plant is established it can tolerate dry soils due to its rapidly produced deep taproot. The plant may start flowering within 3 weeks of germination and flowering will continue throughout the summer. Seeds are primarily dormant in the first season, but may germinate the next spring. Seeds may remain viable in the soil for up to five years. Puncturevine plants cannot tolerate freezing temperatures. A typical puncturevine plant will produce 200 to 5,000 seeds during one growing season, depending on available soil moisture and other environmental factors. These seeds and those that did not germinate from previous seasons will contribute to the potential weed population the following year. With its deep taproot, puncturevine competes aggressively for water and nutrients in tree and field crops and turf. Puncturevine in hay will markedly reduce the quality of the product. When allowed to grow unchecked, puncturevine will develop into a thick mat, hiding the sharp burrs. Even under limited growth conditions, puncturevine's prolific production of the seed burrs creates dangerous conditions for livestock, people, and pets. Grazing livestock in areas infested with puncturevine is not recommended. The sharp spines of the seed burr can injure the mouth and digestive tract or feet of animals. Puncturevine can be particularly toxic to sheep, causing sensitivity to light resulting in skin lesions and swelling of ears and lips. Severe effects include blindness, necrosis of skin, loss of lips and ears, and death in young animals. Additionally, puncturevine may contribute to nitrate poisoning in sheep and cattle. Symptoms of nitrate poisoning include labored breathing, staggering, tongue and the white of the eyes turning blue, and loss of appetite. Long-term control of puncturevine can be achieved by reducing the amount of seeds in the soil. This is best accomplished by removing plants before they produce seeds (i.e., before or at flowering) and continuing to do so over several years. Burrs that have dropped after removing the plant may be collected and removed by sweeping or raking the ground. Even patting the ground with a piece of carpet will help collect the burrs. Biological control from two introduced weevils is also very effective, but there may be resurgences every few years as the number of the weevils decline along with the population of the puncturevine. The primary method of management for puncturevine in the home landscape and garden is removal of seedlings and older plants by hand or hoeing, taking care to also remove any burrs that fall off the plant. 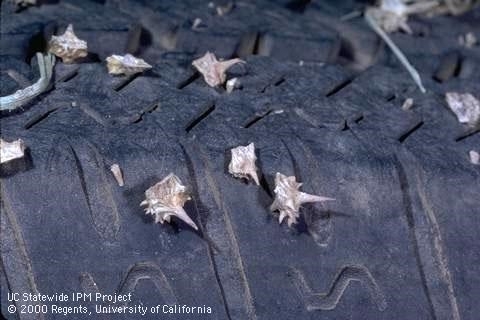 Avoid bringing puncturevine into uninfested areas on shoes and the wheels of mowers or carts. In most situations, puncturevine is best controlled by hand removal or by hoeing to cut the plant off at its taproot. Monitoring the area and removing the weed throughout the late spring and into the summer will greatly reduce the impact of the weed the next year. Shallow tilling (about 1 inch deep) of seedlings or small plants can be effective in larger areas. Deeper tilling is not recommended since this may bury seeds and they may be able to germinate for several years afterwards. Hand removal, hoeing, or cultivation should be initiated prior to flowering and seed production. Mowing is not an effective method of control since the plant grows low to the ground. 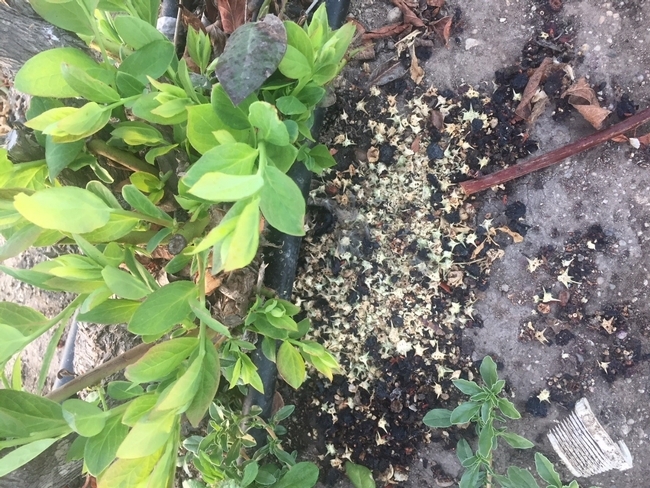 Mulches can be used to control common puncturevine in ornamental plantings, orchards, vineyards, vegetable crops, and gardens, if they screen out all light. To be effective, organic mulches should be at least 3 inches thick. However, puncturevine burrs that fall onto mulch surfaces can establish on the mulch surface due to the puncturevine's deep taproot. Synthetic mulches, which screen out light and provide a physical barrier to seedling development, also work well. Aeration of compacted sites and planting competitive desirable plants can also reduce the impact of puncturevine by making the area more favorable for the growth of the desired plants and reducing resources available to the weed. Two weevils, Microlarinus lareynii and M. lypriformis, native to India, France, and Italy, were introduced into the United States as biocontrol agents in 1961. Microlarinus lareynii is a seed weevil that deposits its eggs in the immature burr or flower bud and the larvae feed on and destroy the seeds before they pupate and emerge as adults, disperse, and start the cycle over again. Generation time is 19 to 24 days in the summer in southern California. Microlarinus lypriformis is a stem weevil that has a similar life cycle except that it lays its eggs in the undersides of stems, branches, and the root crown. The larvae tunnel in the pith where they feed and pupate. 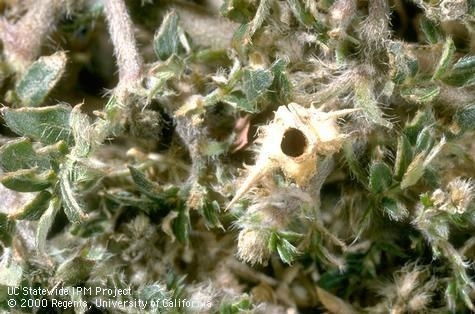 The adults emerge from holes chewed in the upper surfaces of the stems, branches, and crowns. Adults of both species overwinter in plant debris. Although the stem weevil is slightly more effective than the seed weevil when each is used alone, the weevils are most effective if used together and the puncturevine is moisture-stressed. Both species of weevils are available for purchase from biological control suppliers but purchase and release is not generally recommended because weevils collected from other areas may not survive at your location. In most California counties where releases would be beneficial, county agricultural commissioners have release programs or can direct you to collection sites where you may be able to collect them yourself. Contact your county agricultural commissioner's office for more information. Emergence hole of the seed weevil, Microlarinus lareynii, in a puncturevine seed capsule. Chemical control is generally not necessary for the control of puncturevine in the home landscape. However, in large areas, or places where there was a heavy infestation in previous years so that it's difficult to remove by hand, hoeing, or tilling, herbicides may be used to control puncturevine. There are few preemergent herbicides that are effective. Products containing oryzalin, benefin, or trifluralin will provide partial control of germinating seeds. These must be applied prior to germination (late winter to midspring). After plants have emerged from the soil (postemergent), products containing 2,4-D, glyphosate, and dicamba are effective on puncturevine. The smaller or younger the plant, the better the postemergent herbicides work. Dicamba and 2,4-D will injure most broadleaf plants so it is important that they only be applied to the weeds and drift is minimized. They can be applied to lawns without injuring the desired grass. Glyphosate will kill or injure most plants so it should only be used as spot treatments or on solid stands of the weed.